Part of the GAPS diet is ginger tea with honey. 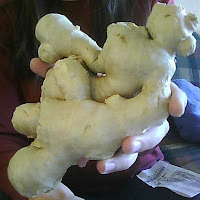 Here is a whole ginger root, I've never bought one this big. It's not organic, but the organic ginger roots that I've seen lately are shriveled sad little things- and expensive. So we're doing not organic right now. Ginger tea is warming for fall mornings, and is also a natural sore throat remedy. Put filtered water in a sauce pan to boil. Break off a knob of the ginger, about thumb-sized. Peel with a knife and slice thinly (I've been using a steak knife for slicing because it gets through the fibers easily) into rounds. Simmer in water for about 5 minutes. Pour into your cup, I use a fork to hold back the ginger rounds. This real food fresh tea is a part of Real Food Wednesday! Chicken Stock for real homemade chicken soup is easy to make, and it really is healing to prevent and heal illness. 0 Response to "Ginger tea for GAPS and sore throats"